There was a batter smell on opening the bag with a light spice, which was fairly unsurprising given the description on the packet. These battered broad beans had a good crunchy texture, slightly crumbly, and were only slightly greasy to the touch. Once I'd got through the crunch these battered broad beans tasted mainly of batter and beans, with a very mild chilli spice, and had undertones of pepper and garlic. These battered broad beans were very mildly salty too, but they didn't need further saltiness as the subtle flavours in the batter and crunchy beans did all the work for my tastebuds. 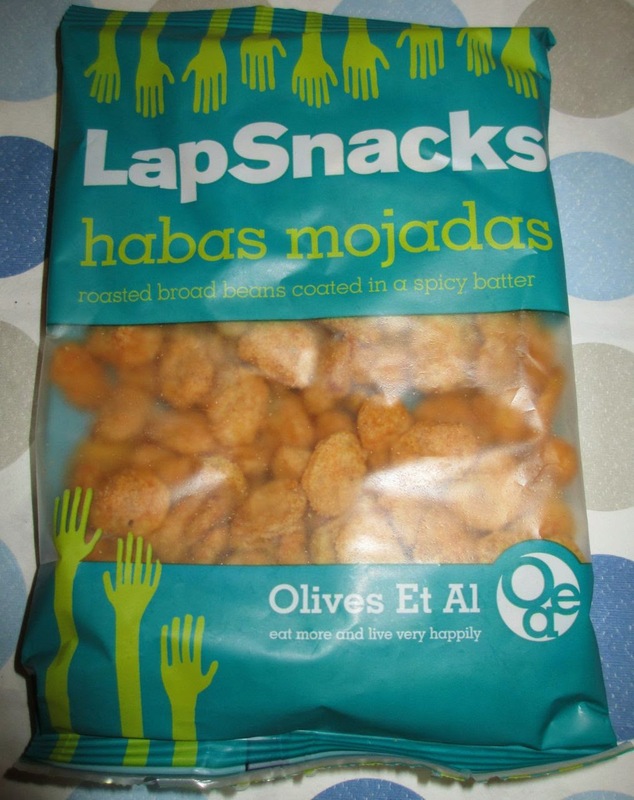 I found these Habas Mojadas very moreish, easy to eat and without the bloating that some snacks like nuts can produce. They were healthy feeling and the 200g bag went a long way. The packet suggests sharing with friends, but I couldn't help splitting the bag over two lunchtimes at work. 200g bag with 526 calories per 100g, having 12g of sugar and 29g of fat. Ingredients included; broad beans, vegetable oil, wheat flour, cane sugar, chilli powder, salt, garlic and pepper. Contains wheat flour and was prepared in a factory that uses peanuts, nuts and sesame seeds. Other LapSnacks in the range are; Chilli Puffs, Habas Fritasm and Sesame Peanuts. These battered broad beans had quite a title. Apparently Captain Tiptoes had help in creating these fiery wasabi battered broad beans from his friend The Great Fujimoto Flyer, who is a human cannonball. I’m sure The Great Fujimoto Flyer had the inspiration for these “Redoubtably Firm Fire Balls Red Hot Beans of Combustiblance” after a particularly explosive outing from his circus cannon produced a pair of flaming hot fiery nuts, possibly the remains of a bag of roasted peanuts he had been munching on beforehand, but no-one could tell amongst all the smoke! On opening the bag I noticed these broad beans were covered in the same type of battered wheat flour that the Habas Mojadas were. The broad beans smelt of batter and had no noticeable fiery wasabi smell, only the slightest whiff if I could try to imagine it. After reading the flaming hot fiery heat warnings on the fire engine red bag, this lack of wasabi in the smell instantly put me at ease. Usually from the wasabi peas I’ve tasted in the past, I’ve smelt wasabi on opening a packet. On pouring out the multitude of battered broad beans there wasn’t even a green tint to them. And then I popped a couple in my mouth to crunch on. Oh my! The shear nose tingly wasabi burn almost blew me off my chair. A few more made my nose run and my eyes water. The very tasty crunchy batter broad beans had an odd masochistic air about them of wanting to eat more, yet fearing to eat more, and fearing to stop eating more, but wanting to eat more all the same. You could really catch someone out with these at a party if you just put them in a bowl without a label for a laugh. Having said that if you want to be kind, add a label that states; “Not for the faint hearted!” These battered broad beans were not as crumbly as the Habas Mojadas and were definitely the seriously dangerous end of the battered broad bean flavour spectrum. They certainly woke me up for an afternoon’s work and I would happily cough, sweat and sneeze over a bag every day! 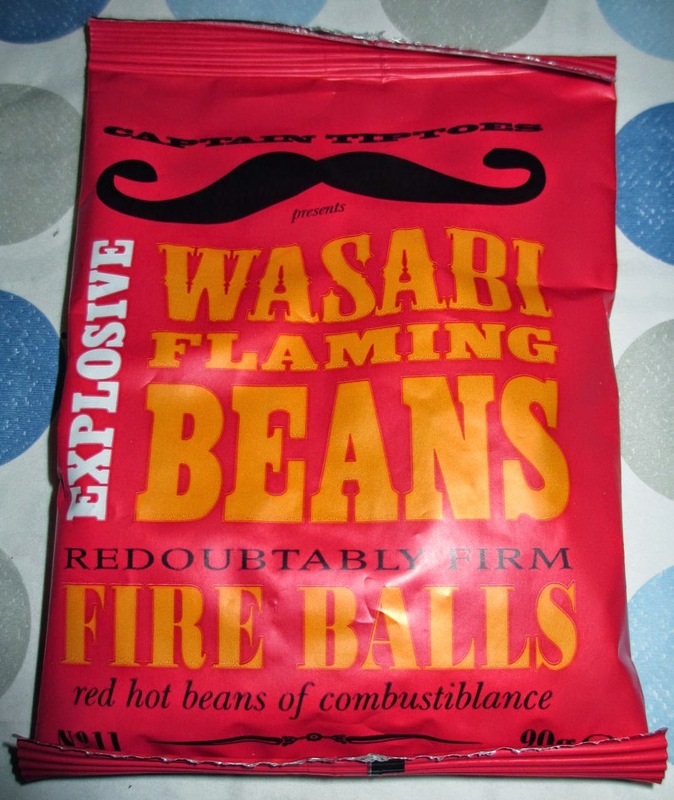 However, I did learn one valuable lesson which was not to eat these Wasabi Flaming Beans and a sandwich full of Flaming Hot Coleslaw in one lunchtime. I almost had to take trip to Accident and Emergency!